When you think about Thanksgiving side dishes, you might think of a variety of delicious recipes that fill your table. Thanksgiving dressing, mashed potatoes, green bean casserole and of course easy sweet potato casserole. 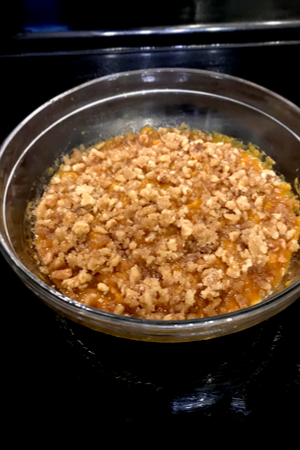 Easy Sweet Potato Casserole topped with a nut crumble. Every year when it was time to fill our plates with a plethora of food, I would always skip the sweet potato casserole. As a child, sweet potatoes were not a common side dish served at our house. And the mixture of browned marshmallows and chopped nuts didn’t appeal to me at all. Instead, I would fill my plate with turkey, mashed potatoes and dressing and call it a meal. To make the potatoes cook faster, peel and cut them into smaller sections. So when I was asked to make sweet potato casserole to bring to a Friendsgiving celebration I began to panic. All I knew was that I needed to find an easy sweet potato casserole recipe. I couldn’t stand the thought of marshmallows topping the plate of such a decadent side dish. So I decided to focus on a casserole with a nut crumble topping instead. Because I didn’t want to admit that I didn’t know how to make even an easy sweet potato casserole, I gave it a few practice trials beforehand. 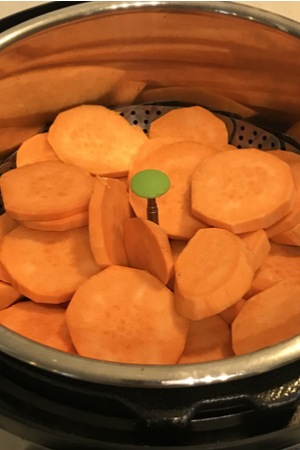 Cooking the sliced sweet potatoes in a steamer basket in the Instant Pot. 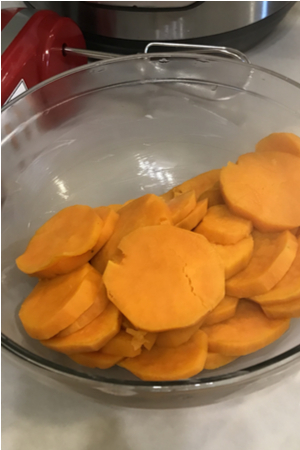 I was shocked to find out how long it took for the sweet potatoes to cook and become tender. I baked them in the oven and 50 minutes simply took too long. So I turned to my pressure cooker to get the potatoes to cook in the fraction of the time as it took in the oven. To make it even faster, I peeled the potatoes and sliced them to allow for a faster cooking time. 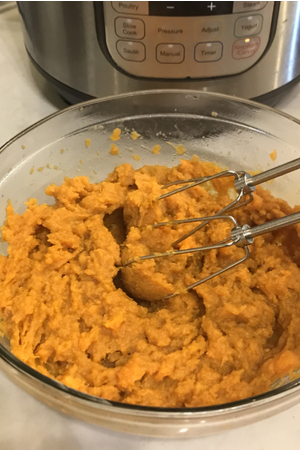 From start to finish the sweet potatoes were ready to be mashed in just 15 short minutes. Of course, you can also boil the potatoes in a stockpot and achieve the same results. However you choose to cook your sweet potatoes, place them in a mixing bowl once cooked. I just prefer to not stand over a hot pot of boiling water and constantly checking it to make sure it doesn’t boil over. I then opened my pantry to see what I could add to the sweet potatoes to make them extra delicious. I knew that baked sweet potatoes are typically topped with butter, brown sugar and cinnamon. Butter and spices provide additional flavor to this delicious casserole. 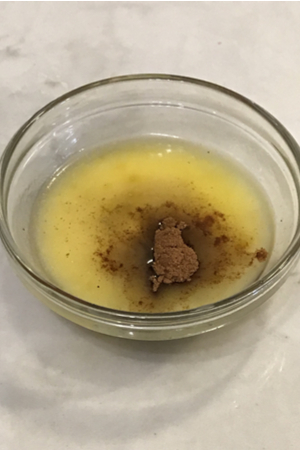 Because I was out of cinnamon, I decided to use the pumpkin pie spice that was still in the cupboard from the various pumpkin recipes that I made the month before. Of course, when mashing potatoes, milk is typically used to make a creamier base. I added some cream and egg as a binder since we were making a casserole. Now all that was left was to make the topping. I adapted my crumble topping that I typically make for Apple Crisp. A little butter, sugar, and flour. Instead of oats, I mixed in chopped pecans. Use a hand mixer to make sure that all the spices and cream are evenly mixed. Into the oven it went! Once it came out of the oven it looked great. There was only obstacle left – the friend’s taste test. When we arrived at our friend’s house I confidently set the dish on the counter with the rest of the side dishes. No one could sense how nervous I was about the easy sweet potato casserole. Would it taste good? Would it be awful? The jury was out. I sighed a breath of relief when I saw the first person go back for seconds. And then there was another, and another until the dish was empty. 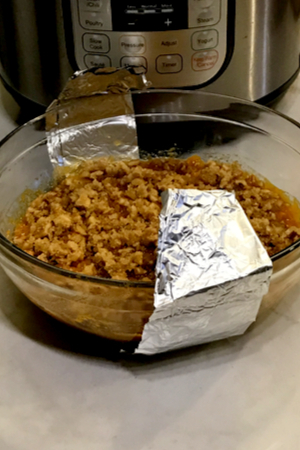 If you decide to make your sweet potato casserole in the Instant Pot make a foil sling for easy lifting. Since then, I have been asked for the recipe several times. Subsequently I have been asked to bring the easy sweet potato casserole to our annual Friendsgiving celebration. Sometimes the easiest and simplest recipes are the best! 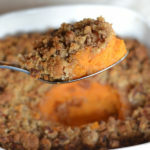 Classic sweet potato casserole topped with a nutty crumble and is perfect to serve for any holiday meal! 2 large sweet potatoes about 2 lbs. 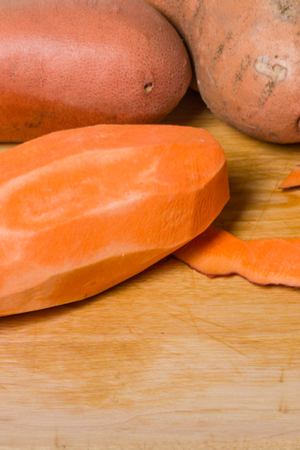 Peel sweet potatoes and cut into 1/4-inch slices. Add 1 cup of water to the liner of the Instant Pot. Put a steamer basket on top of the water. Add the sliced potatoes in the steamer basket. Lock lid in place in the sealed position. Pressure cook/Manual on High Pressure for 8 minutes. Add peeled and cut sweet potatoes in a large stockpot and cover with water. Bring pot to a boil and reduce to simmer for 15 minutes or until the potatoes are very tender. Pour into greased casserole dish. (If coking the casserole in the Instant Pot be sure the dish will fit down into the liner of the pot). For the topping, in a small bowl, mix together butter, brown sugar, flour and nuts and sprinkle over top of casserole. Put the trivet and 1 cup of water in the liner of the Instant Pot. *Make a sling with a 20 inch piece of aluminum foil, folded three times length wise. Place the casserole dish in the center of the sling and use the handles of the sling to lower the dish on top of the trivet. Lock lid in place in the sealed position and Pressure cook/manual on High Pressure for 15 minutes. Quick Release Pressure and remove the dish using the sling handles. Let cool 5 minutes before serving.